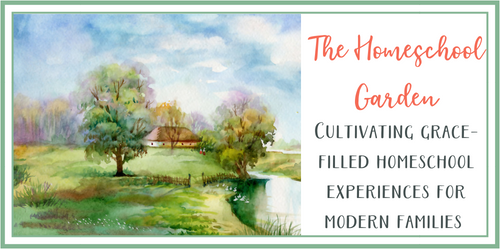 Having a Charlotte Mason Homeschooling house for over 5 years has given me a TON of insight on best practices. There are so many aspects of her practical ways that I cherish. However, my favorite Charlotte Mason principle is narration. 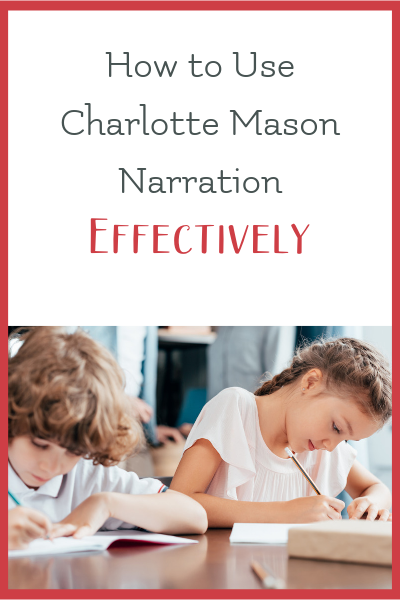 I’d love to share with you the what, why and how to use narration the Charlotte Mason way! Charlotte Mason narration is two-fold: first, your child listens or reads a passage or story. Then, your student summarizes what he or she has read or heard from beginning to end. This narration can come in a variety of formats. Oral narration is best when they are young. Written narration tends to be best when they are older, and can write fluently. I’ve also let my older children type up their narration on the computer to give the typing practice and help with spelling. When your child narrates, they respond in their own words from beginning to end. Your young ones will give very few details initially. However, as they gain more practice, you’ll notice more details and excitement in their voice as they guide you into their story. Younger students will often need a little help with recalling their memory. Utilizing fun, engaging questions is a great way to help them develop their narration skills. Narration is a great tool for memory retention and prepares them for the future. For example, your young narrator will create mental notes or tags in their thoughts to retrieve the information later. In addition, it also helps to build great writing skills as they mature. If you can orally tell a story, you can easily write it down on paper for fluent students. The last benefit that sold me early on as a teacher is strengthening teaching skills. When you can easily retrieve a learning experience, you can also easily share it with others. If your child is doing well with his/her copywork, gradually and carefully begin written narration. Start with one written narration a week on a half sheet of paper. Once he or she has mastered written narration, you can increase it to two a week. Remember, they are still learning how to effectively write, so you’ll notice grammatical errors. Show your student the errors lovingly and correct right away. Eventually, you’ll want to increase the page size to 1 sheet of paper. A Charlotte Mason based curriculum to make your morning time a delight for the whole family. For your younger students, start with one paragraph. Give your child time to read the paragraph and digest it. You may even encourage him to read it twice. Once they have read it, ask them to tell it back to you. Next, begin with the next paragraph, and so on, gradually expanding each week until he/she is confident. Are there names you can recall? What can you tell me about the characters? What do you like about the character(s)? Is there anything in the story that surprised you? Please note that narrating with every book or passage their assigned to can get mundane and turn off the child. Instead, get creative and focus on one reading a day. Assign different types of narration for each day to stir it up a bit. For example, Mondays could be drawing a picture of their assignment. Tuesdays may be narrating using a video recorder on a smartphone. For older students, ask them to send their video via email or text. Wednesdays would be more fun by asking them to create a skit and act it out in front of the family. Thursdays may involve narrating directly to mom or a sibling. Fridays could be ‘pick a card day’ using pre-written index cards. You may write questions they have to answer or narration method they must use. Your student will tend to be more intrigued by narration time and even look forward to it. Whatever creative ideas you come up with, add it to your narration cards! In no time, you’ll have a nice collection of storytelling venues! There are so many ways to make it an enjoyable experience for your children. Since I started teaching my children narration at a young age, it’s made a huge impact on my children’s social skills. Plus, my middle schoolers naturally enjoy telling me what they’ve read. It’s no longer a chore. It’s forever ingrained in their habits now after reading a Charlotte Mason living book or biography. I’d love to hear what works for you or if you have any questions about Charlotte Mason Narration. It’s a process you’ll grow to love — just take it a few steps at a time! Need some tips on how to tell a story? Try this 14-page Storytelling workbook to help guide your children through the art of storytelling! Natalie is blessed to be married with two children. After leaving her IT career in the healthcare industry to raise her children, she decided to homeschool. Besides teaching her own children Charlotte Mason style, she owns two blogs, writes for Homeschooling with Heart and Homeschool Review Crew, virtually assists other bloggers part-time, and teaches English to Chinese students. Natalie loves sharing her Christian minimalist approach with other homeschool moms on her blog at https://contentwithsimple.com. She would also love her readers to drop by and follow her on Facebook, Instagram, and Pinterest.